You’re ready for your internship or volunteer program in Vancouver. Well, almost completely ready. You have a confirmed placement, got your work permit sorted out and you’ve booked your flights. Okay, there might be a few things that you need to take care of, like packing, but that’s a topic for another time. Today we’re passing on a few tips that will help you with your arrival and to get settled in Vancouver. So browse this Vancouver city guide for important information on public transportation, the best Vancity blog and free wifi locations! Through this Vancouver city guide we’ll try to bring closer the eighth largest Canadian municipality located on the coastal seaport of British Columbia. The city itself has the population of 603,502 and 2.4 million inhabitants within the Metro Vancouver area. Vancouver is one of the most ethnically and linguistically diverse cities in Canada where 52% of residents have a first language other than English. The City of Vancouver is one of Canada’s warmest cities in the winter and has the coolest summer average high of all major Canadian cities. During your internship in Vancouver, you will be commuting mostly by public transportation. This is an excellent way to do some ‘free’ sightseeing while you travel, especially since some of the best views of city are from the SkyTrain! Translink is responsible for road and public transportation in Metro Vancouver area. They provide bus services, foot passenger and bicycle ferry, also know as SeaBus, rapid transit services like the SkyTrain and the West Coast Express commuter rail. Their website provides an abundance of information starting from various maps and planners, fares and passes, rider guides and tips on how to get around. Also, there is a neat little feature called ‘Trip Planner’ that will help you get from point A to point B in just a few clicks. In case of all fire, police or medical emergencies, call 911 to get immediate help. All phone calls to 911 are free, whether you call from a pay phone or cell phone. This call should be only of urgent nature i.e. you’ve witnessed a crime, uncontrolled fire, if urgent medical help is needed and so on. The 911 number shouldn’t be used to get information, make complaints or to report a power outage. There is another city number for that (311). Abusing the emergency service phone number might get you fined so call 911 with care! You will most likely arrive a few days earlier before you have to start your internship in Vancouver and it’s important to know how to get from the airport to downtown Vancouver. There are a lot of options like taxi, public transit, car rentals and limousines. In this case, we would definitely recommend using the SkyTrain Canada Line. This is a rapid rail service that connects Vancouver International Airport to downtown Vancouver and parts of Richmond. Trains leave from the airport train station every seven minutes, the trip takes about 26 minutes on a two zone fare and it’s very affordable. The time you’ll spend and memories that you will collect during your internship in Vancouver will have a big impact on you. You might feel a bit homesick, sometimes sad and often very happy and excited! You’ll want to stay in touch with your family and friends that are maybe across an ocean to keep them updated on the adventures you’re experiencing. There will be a lot of pictures that you will need to post on your Instagram, Facebook and other social media accounts so you can show off how amazing Vancouver really is! So in order to make this easier, here’s a map of free wifi hotspots throughout Vancouver so you can always stay connected and make your friend a little jealous. When you get the time to post some of your pictures on Facebook, feel free to share them with us as well! 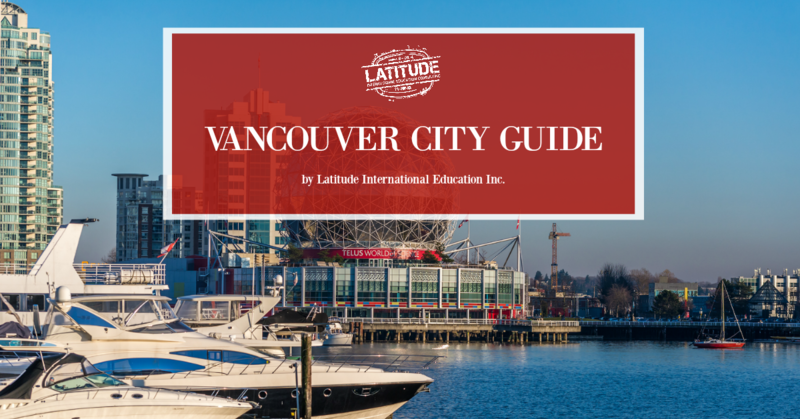 We hope that this Vancouver city guide will be useful and will make your stay even more pleasant! Thinking about taking an internship in Vancouver? We’ve got you covered with our Student Internship Program and Charity Internship Program. Or are you looking for something that will get you out of the city and into the great Canadian wilderness? Try our Wilderness Volunteer Program!